There is a lot of discussion in the water world about One Water. This integrated water management approach asks us to think expansively about how water is used in our communities and to acknowledge the co-benefits of different approaches by collectively examining costs, water supply benefit, environmental impact, equity, and other factors. One Water asks us to break down silos and work collaboratively to collectively manage our water supplies. Is it your community’s future? Maybe or maybe not. But whatever the case, every community in Texas owes it to their residents to look at One Water to figure out if it could be a viable solution. Growth, drought, and climate change dictate that resilient water supply options are needed. One Water requires vision and cooperation. It is achieved through inclusive collaboration in the management of all water systems. This includes involvement by typical water-focused entities with responsibility over water supply, wastewater operations, reuse systems, and stormwater collection and removal. Other departments, however, need to be engaged as well. Communities should include departments that manage energy, parks, sustainability, equity, demographics, and, last but not least, the water users (a.k.a. customers) who will be responsible for supporting and sustaining these initiatives. One Water is scalable. Los Angeles, Seattle, and Denver are large, complicated cities with complex water supply approaches that include One Water elements. Their plans include elements of One Water that are useful to small, medium, and large cities. Los Angeles plans to get a significant portion of their future water supply from local water supplies such as stormwater capture, groundwater replenishment, as well as other strategies. And, these strategies will work for smaller communities. The beauty of a One Water approach is it’s scalable—it’s flexible and communities of all sizes can deploy adaptability. Water supply planning is very “local.” Every community has its own set of water supply challenges based on myriad variables and disparate organizations and decision makers. What agreements have already been entered into and when do they expire? Is the water supply secure? Does leadership support innovative water supplies or are keeping costs low truly the bottom-line? Is surface water or groundwater (or both) a primary source of water? Is the area’s population growing? Is the community in urban, rural, or suburban? Is flooding or water quality a challenge? These are just some of the factors that play into water supply decisions. There are One Water water supply and management elements that can help meet the needs of every community in Texas. One Water seeks to use existing resources more sustainably, rather than exploit new ones. Texas communities have future water needs. Many have BIG water needs, now and in the future. Through employing a One Water approach, our cities’ existing water supplies could become the answer to meeting future water needs. Stormwater can be captured, treated, and used to recharge aquifers, for an aquifer storage and recovery project, or to irrigate parks and sports fields. Buildings can be constructed differently so that rainwater and air conditioner condensate can be used to flush toilets and irrigate landscapes. On a small scale, rainwater harvesting and rain gardens can reduce and alleviate the need for potable water for landscape irrigation. Deploy this strategy on a neighborhood scale and the savings increase and may even have the potential to help reduce localized flooding. Developers and other entities can form proactive partnerships to pilot innovative technologies such as net-zero buildings, landscape irrigation with onsite generated water, and onsite treatment of wastewater. Green infrastructure can serve a dual benefit by slowing the flow of stormwater and allowing it to slowly percolate into the ground thus benefitting water supply and landscapes while reducing the intensity of stormwater and flood flows in creeks and streams. Is your community already practicing One Water? The Texas Living Waters project strives to facilitate sharing and learning among Texas’s water utilities. We think that the best way to learn and gain perspective is from each other, and we would like to hear from you. 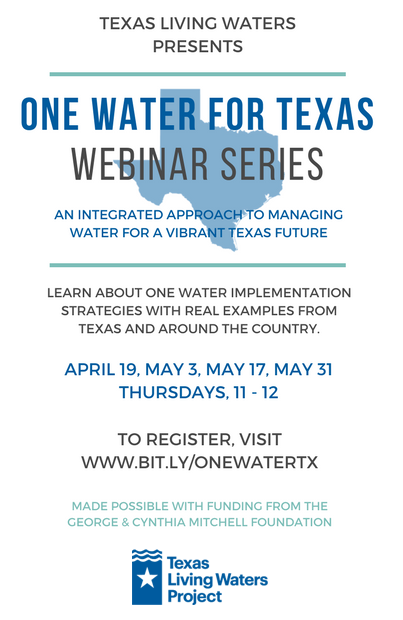 To that end, join us in April and May as we learn together at the free One Water for Texas webinar series. One Water for Texas will inform participants on the processes involved with implementing One Water strategies in their communities with real examples from Texas and around the country. The Texas Living Waters Project has long advocated for smart water solutions that ensure that we have an adequate, sustainable water supply for people, businesses, and the environment. One Water solutions show real promise in helping to meet that goal. It is an approach that allows us to meet our future water needs while protecting the health and vitality of Texas’s natural heritage. Jennifer Walker is the Senior Program Manager for Water Programs at the National Wildlife Federation. She works on the Texas Living Waters Project. For more information, visit www.texaslivingwaters.org.